What are the conflicting opinions about vaccines? Yes, you're right. Whether you give vaccines to your pet or not is the question. Should you? Should you not? Some of you may wonder if your vets just try to get your money when vaccines are not even necessary. Are they not? Gee, already lots of question marks. To be put bluntly, my answer is a big yes. But why? 1. Vaccines increase the antibodies to fight against the disease that they are designed for. 2. The result of infection that the vaccines are for could be fatal and even if the treatment is successful, more than likely it would be very costly. 3. The smallpox vaccine that Ed Jenner invented in 18th century could very well be the one that saved the human race. Not to mention all the other vaccines developed along the way. 4. There is a report that there are numerous viruses and bacteria that we haven't even contacted or don't know about. How do you think we will prevent the extinction of human race or your pets if one of them starts disastrous disease in the future? The bottom line is that the cost or side effects of those vaccines are so minute compared with the benefits. Yes, there is no perfect vaccine that does not cause any side effect and some of your pets will be affected with that. But can you justify the loss (worst case senario) of your animal or many animals in your neighborhood infected from your pet because you chose not to update your pets' vaccines? There was a recent outbreak of distemper virus in San Bernadino county shelter that ended up killing more than 80 dogs. It could've been prevented had the dogs been vaccinated. 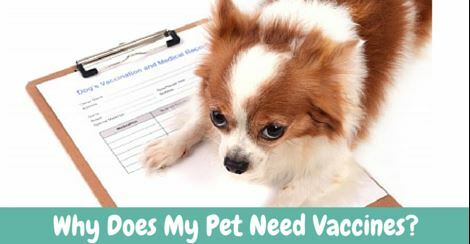 Giving vaccines, these days, is more important than ever when there are so many people living in this world and when more than half of Americans have a pet(s) in their house as these factors make it more likely for pets to directly or indirectly contact each other and spread diseases.